stronger and with a whole new set of features. Click and discover the new features! The last Robin innovation… a FREE service for RobinVOL customers. Run RobinVOL strategy on multiple pairs and timeframes in a safe. Get new settings every week along with the combination of settings we recommend for each account size. Portfolio constantly get for you new strategies, discard others, change risk weights based on new market. RobinTradingHub is a trading product hub that provide you with products and services to operate in markets. The core of Robin is RobinVOL Forex Expert Advisor for Metatrader, one of the bests forex EAs in the world. RobinVol is nowadays available both as a product or as a signal service within MyFxBook, depending on your needs. The suite includes other software like Robin Watchdog, an active monitorization solution for Metatrader. Robin is a growing up family with new products and services coming soon, visit our roadmap page in order to discover new functionalities. 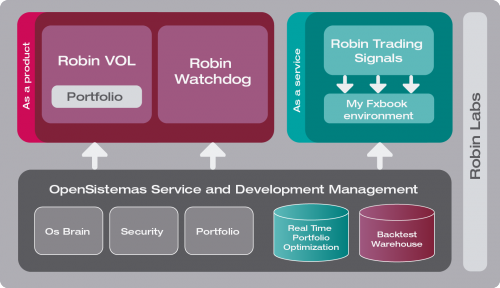 Robin is constructed over OpenSistemas Service and Development Management Environment, a framework for organizing the trading data, information management and trading technology components that are used to build our Trading products and services. It involves osBrain, the OpenSistemas multiagent software for trading environment, used to create new trading products. Besides it includes a set of architectural components that are used to transform raw transaction data into a consistent and coherent set of information that is suitable for creating value. For example, this part of our architecture typically includes data integration, data cleaning and the creation of data marts and data warehousing to create new models and services based on historical data and backtest info. Be the first one to find out all the exciting RobinHub news, releases and updates. Sign up and we'll keep you in the loop! The first time I saw Robin VOL, I was deeply impressed by its unlimited potential. Then I started to burn the midnight oil to create and optimize new settings for Robin VOL day after day. I've never seen more flexible and robust expert advisors than Robin VOL - this is the best EA ever in my life, no doubt about it. I'm truly grateful to Fernando for the release of such a wonderful EA! FMonera has been a great source of knowledge and inspiration to many traders and EA developers like ourselves. His commitment to help fellow traders to choose the right EA has been great and almost every post made on the Donna Forex forum has been in the form of contribution to share information. He not only helps traders but also developers who seek his advice. We have greatly benefited from the knowledge base he has created on the Donna Forex Forum and also our direct interactions with him. RobinVol EA will naturally be one of the best products that is available commercially since it is developed by FMonera himself, the Grand Master of automated trading.